1. Preheat the oven to 350 degrees . Grease and flour two 9-inch round cake pans. Line the pans with parchment and grease the parchment. In a medium bowl, combine the flour, baking powder and 1/2 teaspoon salt. 2. Using an electric mixer, beat 1/2 a pound butter and the granulated sugar at medium speed until fluffy, about 5 minutes. Stir in 1 tablespoon plus 1 teaspoon vanilla and a pinch salt. Gradually add the egg whites, beating on low speed and scraping the side of the bowl. Beat at high speed for 1 minute until smooth. Mixing at low speed, add the flour mixture in 3 parts, alternating with 1 cup milk. Beat at medium speed until smooth, about 30 seconds. 3. Transfer the batter into the prepared pans. 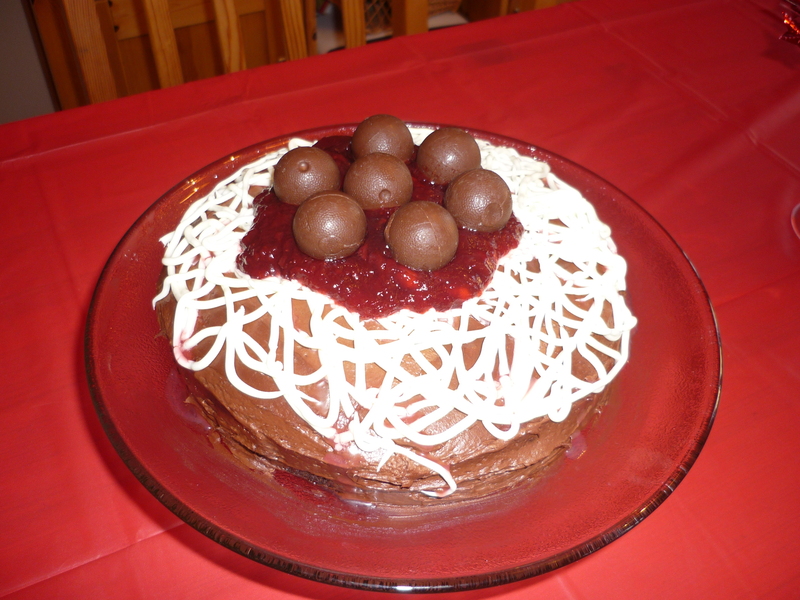 Bake until a toothpick inserted into the center of the cake comes out clean, about 40 minutes. Let cool for 10 minutes, then invert the layers onto a rack, discard the parchment and let cool completely. 4. Meanwhile, using an electric mixer, combine the remaining 1/2 a pound of butter and the confectioners sugar at low speed. Gradually add the remaining 2 tablespoons milk and 2 teaspoons vanilla and beat at high speed until fluffy, about 5 minutes. 5. Transfer 1/4 cup of the frosting to a small bowl. Add enough food coloring to make a vivid red. 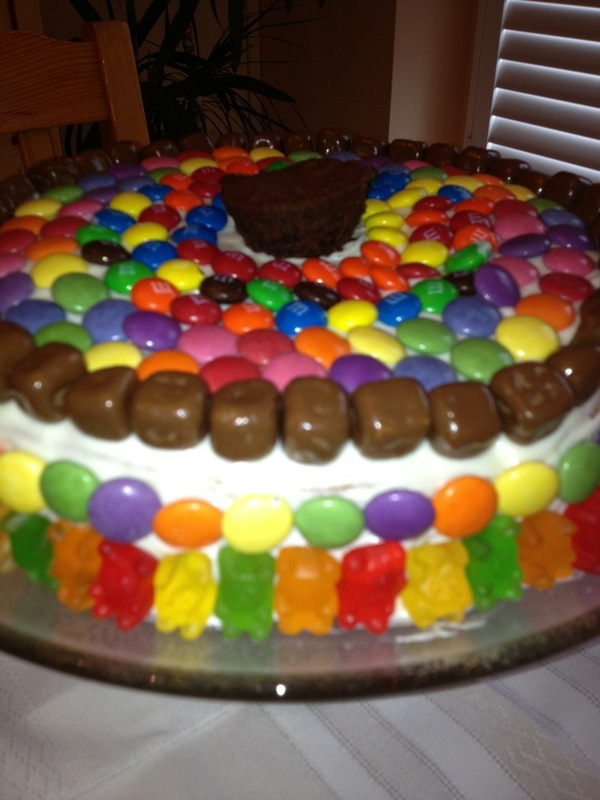 Place 1 cake layer on a platter. Spoon a large dollop of plain frosting in the center of the layer and spread to within 1/4 inch of the edge. 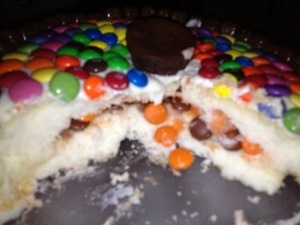 Place the second layer on top of the first and frost the top and side with the remaining plain frosting. 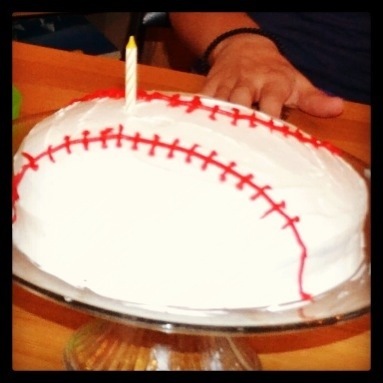 Using a resealable plastic bag with one corner snipped off, pipe the red frosting onto the cake to look like baseball stitching. 7 round chocolate pieces – have extra on hand! 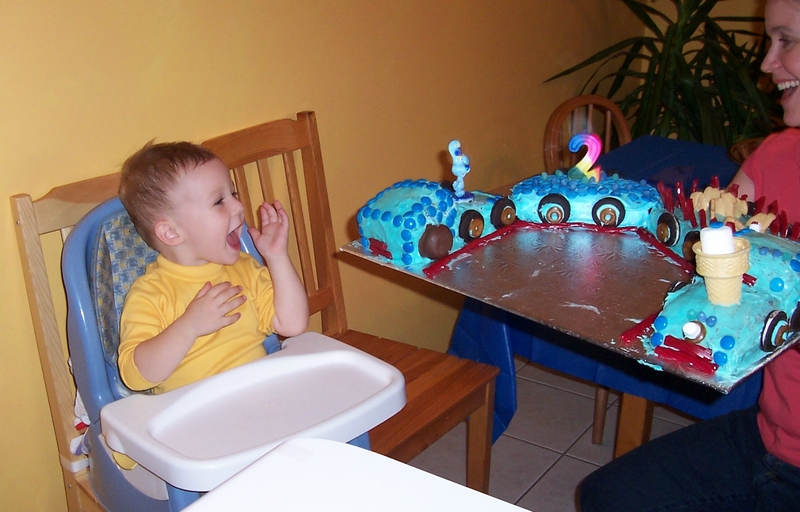 LINE up cakes on large serving platter to resemble the cars of a train. CUT a 2-inch crosswise slice off front end of first cake; place at back end on top of first cake to resemble the engine car. 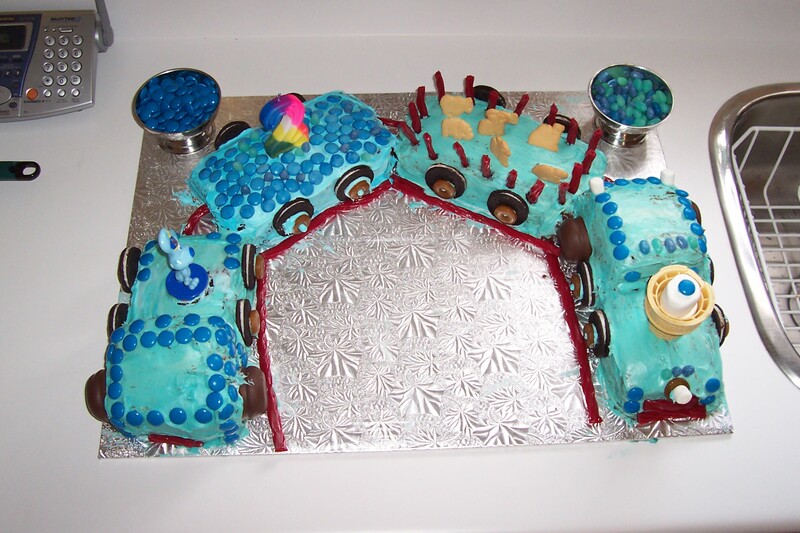 Repeat with the last cake, placing removed cake slice on middle of cake to resemble the caboose. SPOON Cool Whip into 4 small bowls; tint with food colourings as desired. Use to frost cakes. 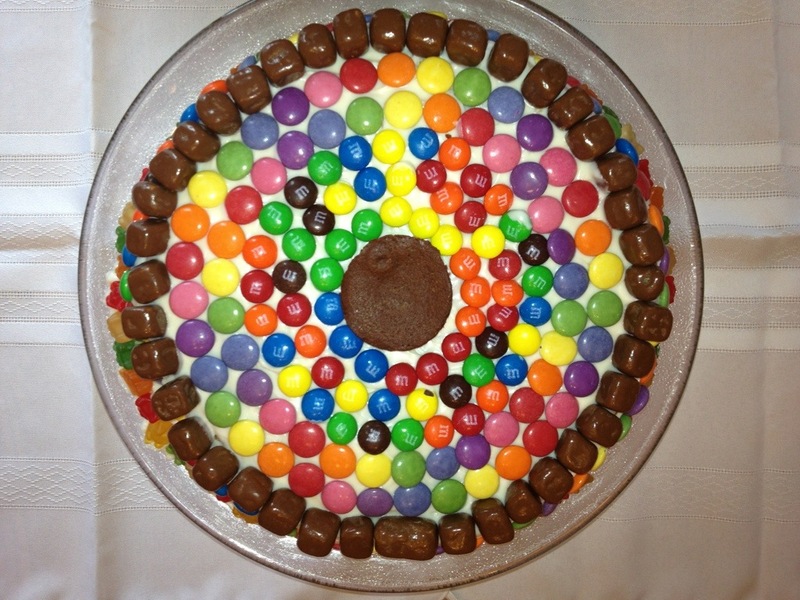 Decorate with remaining ingredients as shown in photo. Keep refrigerated.